NO PRE ORDERS WILL BE TAKEN FOR EGGS OR BIRDS . The online purchase system for hatching eggs is limited to 12 eggs by next day delivery post. It is limited to 12 eggs to keep the postage costs reasonable, with all payments made through paypal. There is also an option at the checkout to arrange personal collection of the hatching eggs. If you choose this option pickup is by prior arrangement only once we have confirmed they are ready for collection. Larger quantities of hatching eggs are available but please contact us to discuss the delivery option required or to arrange personal collection. WE ARE ONLY PREPARED TO DISPATCH EGGS BY NEXT DAY DELIVERY AS WE WANT YOU TO HAVE THE BEST CHANCE OF VIABLE EGGS, AND THE LESS TIME THESE EGGS SPEND IN THE POSTAL SERVICE THE BETTER CHANCE OF GOOD HATCH RESULTS. THIS COST ALSO INCLUDES THE POLY BOXES AND THE MANY TRIPS TO THE POST OFFICE THAT I MAKE, AS I WILL ALWAYS ENDEAVOUR TO DISPATCH EGGS JUST AS SOON AS THEY HAVE BEEN COLLECTED. PLEASE BE AWARE THAT WE DO NOT SEND HATCHING EGGS TO THE USA OR CANADA OR TO TO ANY COUNTRY OUTSIDE OF EUROPE. Please view the list below of our hatching eggs for sale and their availability. If you wish to order hatching eggs simply click “add to wicker basket” and if they are available they will be added to the cart. If they are unavailable a pop up message will appear. You can change the quantities of hatching eggs by entering a number before adding to wicker basket. Although we have a very large flock and many breeding groups to collect from please understand that due to the nature of poultry and egg laying we may on occasion have a small delay in fulfilling your order. Due to the deterioration of eggs over time we will only send eggs that are less than one week old to give our customers the best chance of viability. Total number of hatching eggs ordered online to be sent in one shipment is 12 due to postage prices. If anymore than 12 eggs are required please contact us for other postal options. By paying in full today through our online ordering service, you are reserving the hatching eggs from the colour of orpington you require. This is dependent on various factors out of our control that affect egg production, and orders could take a week or two to gather together for collection/despatch. If hatching eggs are required as a matter of extreme urgency please contact us first and we will confirm any further information. 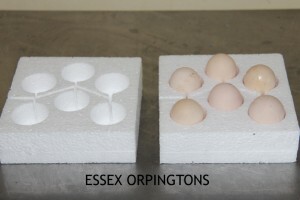 All online orders of Orpington hatching eggs will be treated on a first come first serve basis and despatched as soon as the hatching eggs in the colours you require become available. Please bear this in mind when ordering online and if you wish to contact us to discuss the order then please do so. PLEASE BE AWARE THAT WE ARE NOT TAKING PREORDERS DURING 2016. 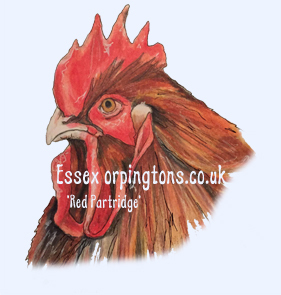 ANY AVAILABLE EGGS OR BIRDS WILL BE LISTED ON THE WEBSITE AT THE APPROPRIATE TIME. 1 x White Orpington hatching egg laid by our own hens. 1 x Lemon Cuckoo hatching egg laid by our own hens. 1 x Red Wheaton orpington hatching egg laid by our own hens. 1 x Blue Splash hatching egg laid by our own hens. 1 x Buff orpington hatching egg laid by our own hens. 1 x Chocolate hatching egg laid by our own hens. 1 x Red orpington hatching egg laid by our own hens. 1 x Crele hatching egg laid by our own hens. 1 x Red crele orpington hatching egg laid by our own hens. 1 x Silver Laced orpington hatching egg laid by our own hens. 1 x Blue Partridge orpington hatching egg laid by our own hens. 1 x Blue Silver Birchen orpington hatching egg laid by our own hens. 1 x Jubilee orpington hatching egg laid by our own hens. 1 x Lavender Isabel orpington hatching egg laid by our own hens. 1 x Chocolate Cuckoo orpington hatching egg laid by our own hens. 1 x Quail crele orpington hatching egg laid by our own hens. 1 x Delaware orpington hatching egg laid by our own hens. 1 x Chocolate partridge orpington hatching egg laid by our own hens. To maximise successful breeding our birds are fed a top quality breeding ration and live in a clean, well-maintained environment, with both internal & external enclosures .Whilst we make every effort to ensure the best possible chance of our birds producing fertile hatching eggs, we have to take into consideration the UK weather pattern, which often affects the way a breeding group performs. Also transportation of hatching eggs in the postal system can greatly reduce hatchability if they have been mis-handled at any point during the collection/delivery process. We will only dispatch fresh hatching eggs (max 7 days old). All hatching eggs will be packaged in purpose-made polystyrene boxes. Please ensure that all hatching egg received through the post are allowed to stand pointed end down, for 24 hours before the incubation process begins. Our policy is that we offer a minimum 50% fertility rate on all hatching eggs purchased, however we must be notified of their infertility within 10 days of postage. We will provide replacement eggs free-of-charge but the purchaser will be responsible for all postage costs. PLEASE BE AWARE THAT WE DO NOT SEND EGGS TO THE USA OR CANADA OR ANY COUNTRY OUTSIDE OF EUROPE.